Soulful Shabbat is a Saturday morning worship experience that creates a space for pause and reflection by simplifying and slowing down the traditional Shabbat service. Soulful Shabbat uses silence, chant, drumming, gentle yoga stretching, poetry and meditation along with traditional davening and Torah study to create a highly participatory prayer experience. Soulful Shabbat is led by Rabbi Alan Flam and lay leaders Judy Kaye and Bruce Phillips. It meets on the third Saturday of the month in the Fishbein Chapel. 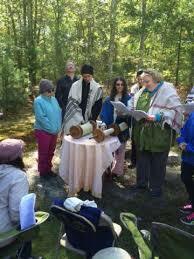 A drumming and chanting preparation-for-prayer precedes Soulful Shabbat at 9:30AM.